Fret wire comes in a variety of sizes and materials. Bound fingerboards require far more work. 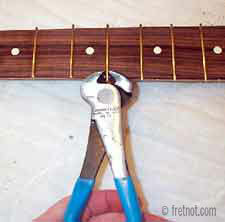 Each fret is sized to fit between the binding with it's crown overlaying the binding. This requires us to nip away a small portion of the tang so that it sits inside of the binding while it's crown overhangs the binding. Painted, maple fingerboards pose a different challenge. 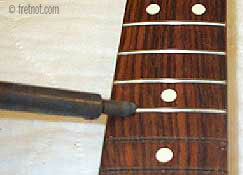 Many manufacturers apply top coats of clear finish to the neck after the frets were installed. 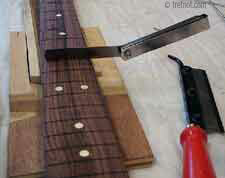 This effectively "seals" the frets under finish and can make for some messy fret removal. 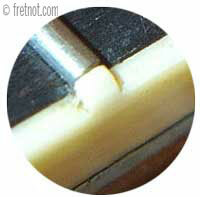 Because in most situations the fingerboard must be sanded, overspray or refinishing will be necessary. Since I have stopped spraying lacquer and avoid contact with other finishing materials I can no longer offer maple neck refret's. Due to the cost of refinishing and refretting a maple fingerboard it is normally only considered on valuable instruments or those with necks that are irreplaceable. Warmoth and other manufacturers offer Fender® licensed copies of Fender® necks. 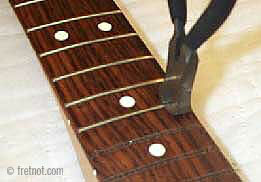 These necks can be ordered with custom specs or from their gallery of pre-made necks.